This Platinum Mix pack is for the connoisseur growers out there, comprising of three of the most resinous strains in the collection. 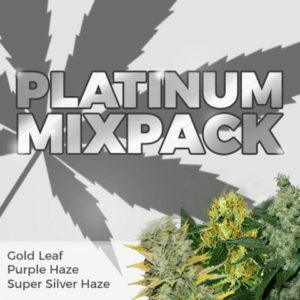 Purple Haze, Super Silver Haze and Gold Leaf, three premium quality strains available in one packet. Choose between packs of 3, 5 and 10 seeds from each of the three strains, making a total of 9, 15 or 30 feminized seeds per packet. Hand selected and separately packaged inside the pack, you can decide which of the three strains to plant first, or how many from each strain. Expect top-quality results and bumper harvests of the most potent weed available. Find out more about Platinum Mix Pack Seeds. Gold Leaf: A great indoor strain with Indica dominant attributes. Produces large, heavy colas and an abundance of buds from its long lateral branches. Increased THC and CBD levels combine, creating a powerful cerebral high, together with a relaxing body-stone. Good Cannabis strain for both day and night-time use. Super Silver Haze: Well-known around the world, Super Silver Haze is ever popular from the Amsterdam Coffee-shops to the US Medical Marijuana Dispensaries. Famed for its long, running cola's and dense, sticky buds covered in glistening THC. Produces a long-lasting euphoric high and relaxing body-stone effect. Purple Haze: Perfectly suited to indoor growing techniques, this strong and colourful Haze variety produces a powerful, almost psychedelic high. Elevated THC levels produce a creative, cerebral effect that leaves you feeling energetic and creative. A great day-time smoke, perfect for enjoying with friends. Read the complete Platinum Mix Pack Review. Buy Platinum Mix Pack Seeds today and receive free worldwide shipping guaranteed.